Find DEET Free Mosquito Repellent at Lochte Feed and General Store. Skeeter Screen Mosquito Repellent is a safe, DEET free product. The Patio Egg is a safe, easy and effective way to keep the mosquitos and other biting insects away from your outdoor space. Set it out or hang it anywhere! Grab yours today and start enjoying the great outdoors again. 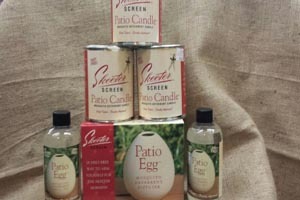 Stop by Lochte Feed and General Store for mosquito products that repel mosquitos. Keep you, your pets, horses, and cattle free of mosquito bites this summer with quality products. You’ll also find a large selection of natural pest control options at Lochte Feed. Stop in and speak with our pest control experts today! This entry was posted on Friday, May 12th, 2017 at 10:01 am	and is filed under News & Updates. You can follow any responses to this entry through the RSS 2.0 feed. Both comments and pings are currently closed.